DOYLE, A. Conan (Sir Arthur Ignatius Conan), 1859-1930 : THE SIGN OF FOUR. London : Spencer Blackett, 1890. First edition. “Sherlock Holmes took his bottle from the corner of the mantelpiece, and his hypodermic syringe from its neat morocco case. With his long, white, nervous fingers he adjusted the delicate needle, and rolled back his left shirt-cuff ...” – Watson looks on aghast. The second Holmes title, published before the short stories in the “Strand Magazine” were to make him famous. It was commissioned at a dinner at the Langham Hotel in 1889, at which Oscar Wilde also agreed to write “Dorian Gray”. Crown 8vo (189 x 126mm). [iv],(284)pp. Frontispiece by Charles Kerr. Bound in a smart, slightly later (twentieth-century), full red morocco, banded and gilt; inner gilt dentelles; marbled endpapers; lightly rubbed; a few minor marks, but overall a very good copy. 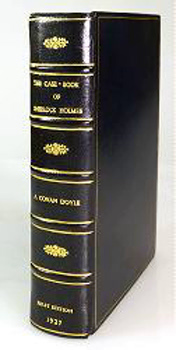 DOYLE, A. Conan (Sir Arthur Ignatius Conan), 1859-1930 : THE CASE-BOOK OF SHERLOCK HOLMES. London : John Murray, (1927). First edition. “I fear that Mr. Sherlock Holmes may become like one of those popular tenors who, having outlived their time, are still tempted to make repeated farewell bows to their indulgent audiences” (from Conan Doyle’s preface) – the last of the Sherlock Holmes books, a dozen final stories including “The Adventure of the Illustrious Client”, “The Adventure of the Mazarin Stone”, “The Adventure of the Sussex Vampire”, etc. 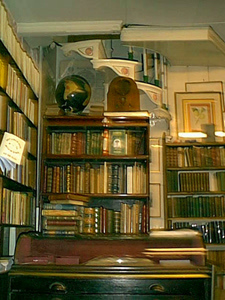 Two of the stories are narrated by Holmes himself, rather than Watson. Crown 8vo (187 x 120mm). 320pp. Bound in an elegant recent full blue morocco, banded and gilt; marbled endpapers; a few very minor signs of use; a few internal spots, but a very good copy, attractively bound. Return to the Detective Fiction index page.